Want the cleanest, closest shave? Want to save money by reducing the amount of shaving cream used? Then check out this cool new Legacy Shave Evolution Brush. 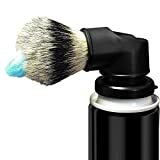 This old fashioned shaving brush universally attaches to all brands and sizes of shaving cream / gel cans to deliver the cream through the brush directly to the face or body. 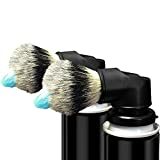 Just connect the brush to the can, press down to release the shaving cream, and rub it around to create a lather - no need to get your hands all messy. A great old-school shaving solution and makes a great gift, especially for Father's Day.